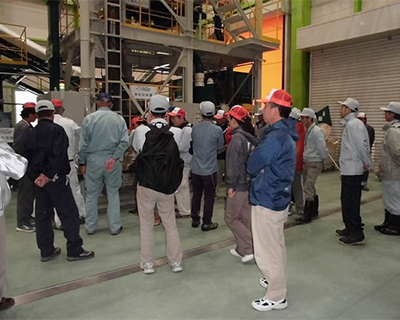 As a company with its roots in rural Fukui Prefecture, the education of our local community as well as our connection with the residents are vital to Fukuvi Chemical Industry. Therefore, we regularly offer internships to students from local schools. Through various hands-on activities related to manufacturing and our operations, we aim to give them practical skills that they can utilize in the future. 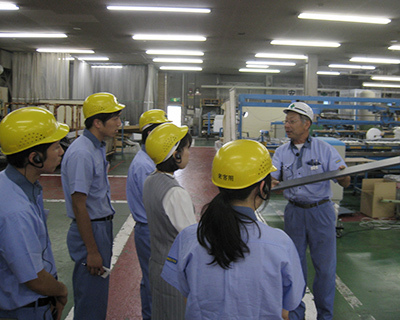 In order to allow many people to see and learn from our manufacturing practices, Fukuvi offers a guided study-tour of our factory. This offers us another chance to educate and connect with our local community, while showcasing our environmentally friendly practices and giving a first-hand look at our manufacturing techniques. Fukuvi places a large emphasis on supporting our community. We take an active role in planning local environmental initiatives, and give our support to various types of local projects. We support and help plan the “Fukui City Environmental Progress Conference”, “Summer Electricity Conservation Contest”, and “Energy Fair” in Fukui City where our head office and main factory are located. Additionally, we support environmental initiatives in the areas of our other factory locations around the prefecture, such as the “Fukui Prefecture Environmental Progress Organization”.